A couple of weeks ago, I posted about doing fabric paper lamination with my local surface design group. 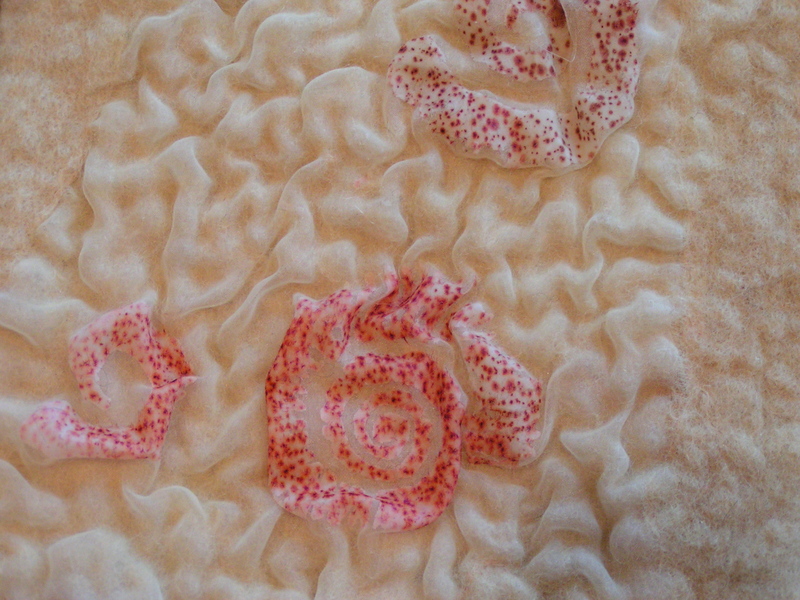 I used three of the pieces that I made to nuno felt the fabric paper on to wool. 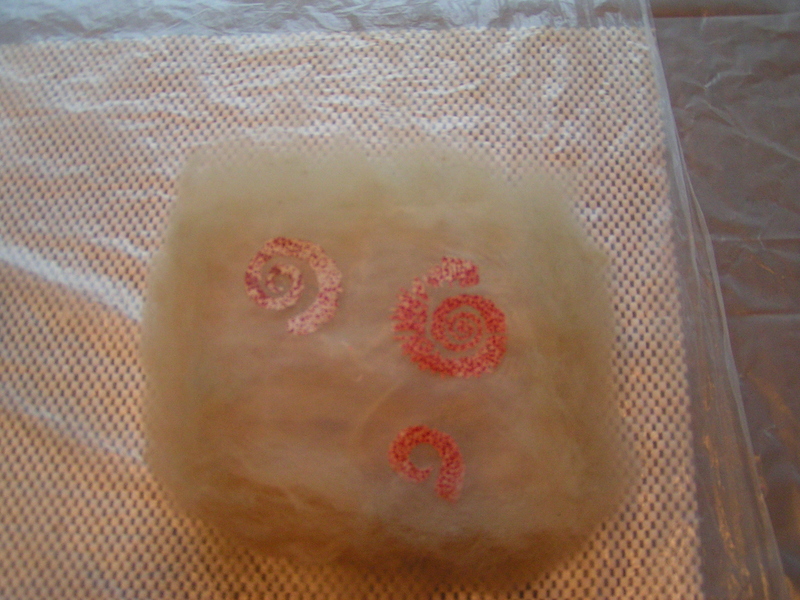 The process worked just like any other nuno felting. The important part is that there is plenty of organza around the image that has been laminated. The images themselves block the wool migration so you need to make sure that there is enough surrounding fabric for the wool to adhere around the image. I laid out the wool and then added the image on top. 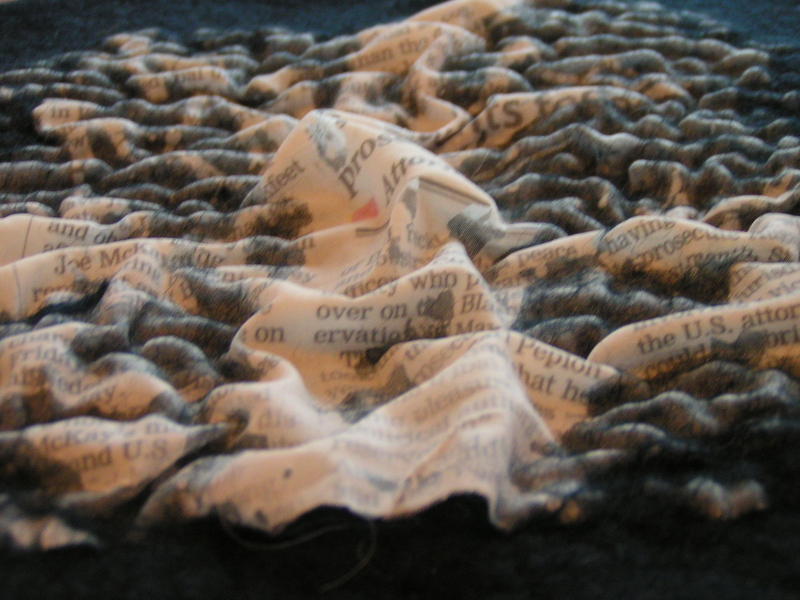 On two of the pieces, I added wisps of wool around the edges. 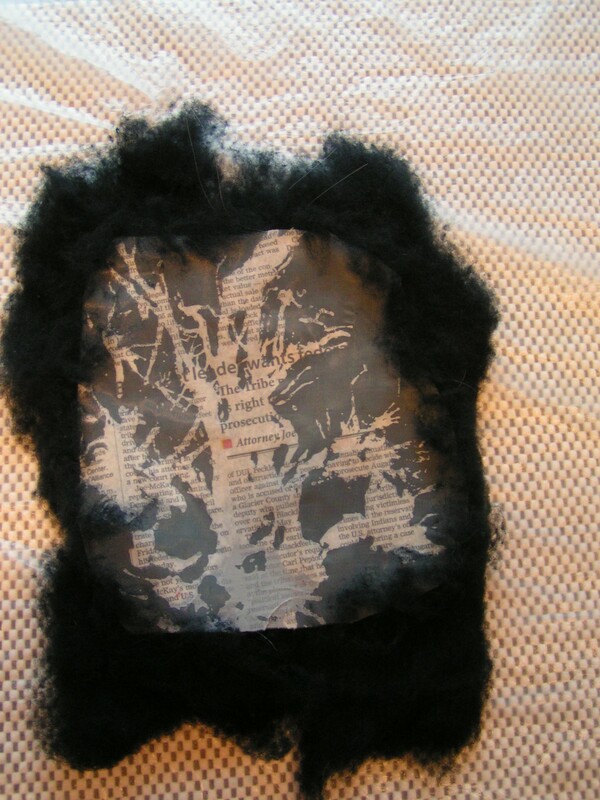 This is the ink blot newspaper image on black short fiber merino. Here’s the bear photo laid out on white merino. I thought I might make this into a book or photo album cover so I made it double the size of the photo. And here’s the last one of fossils laid out on natural dyed wool (I think it is walnut but could be barberry.) I then felted as usual. Here is the result on the newspaper image. From this angle you can see the texture. Here’s the bear. The problem with the photo is that it is such a big section that doesn’t felt, just the edges are adhered. But it has possibilities, don’t you think? 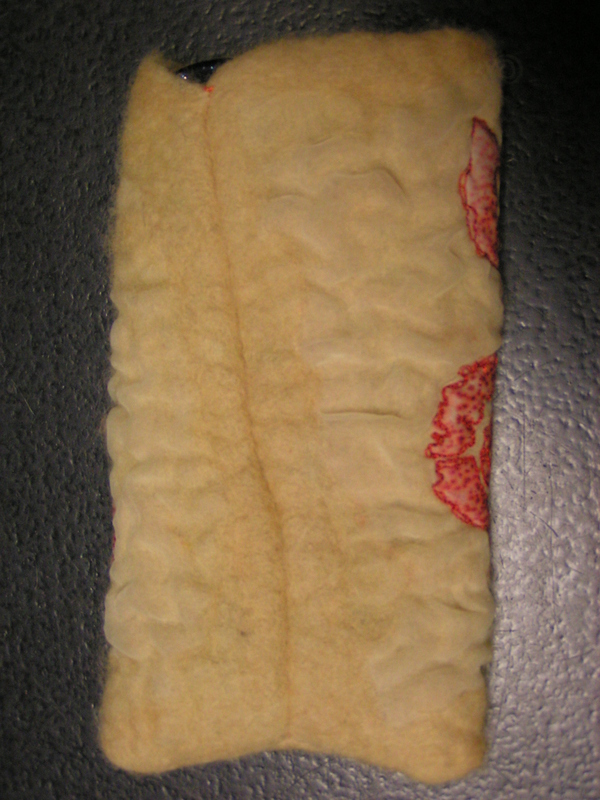 This is the fossils after felting. I love the texture created with the organza, so organic. Here’s a little closer look. 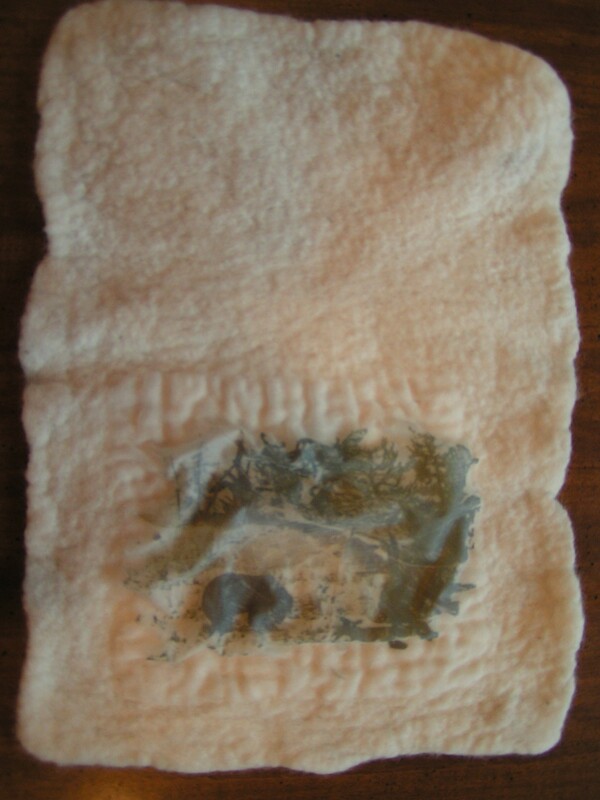 There was no real change in the fabric paper lamination part with the nuno felting. I decided to add stitch to the fossils. 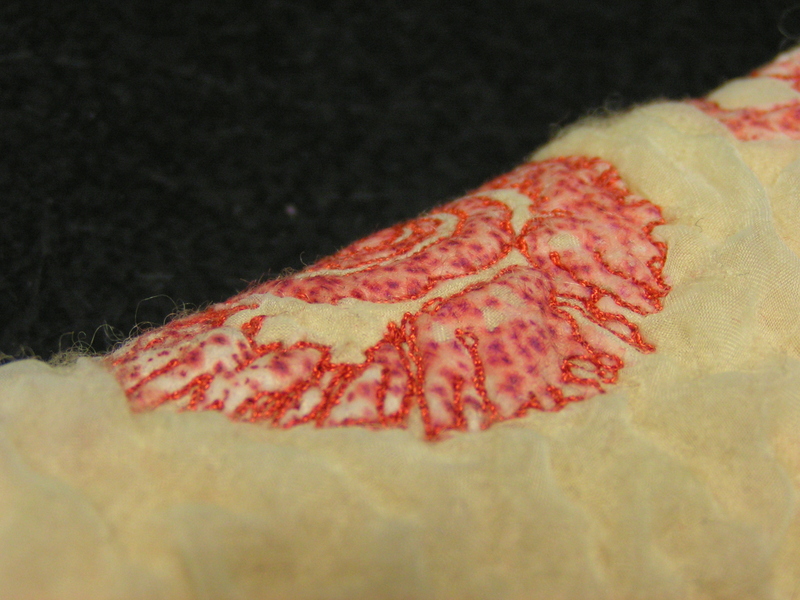 I free motion machine stitched around the edge of the fossils with a dark, burnt orange thread. The fossils are now much more prominent with the stitching added. Here’s the back of the case. The sides of the felt were a bit wonky thus the wonky seam. And one last close up. I really like how this technique worked and I think I will be doing some more of these. A couple of other people tried out the technique as well. 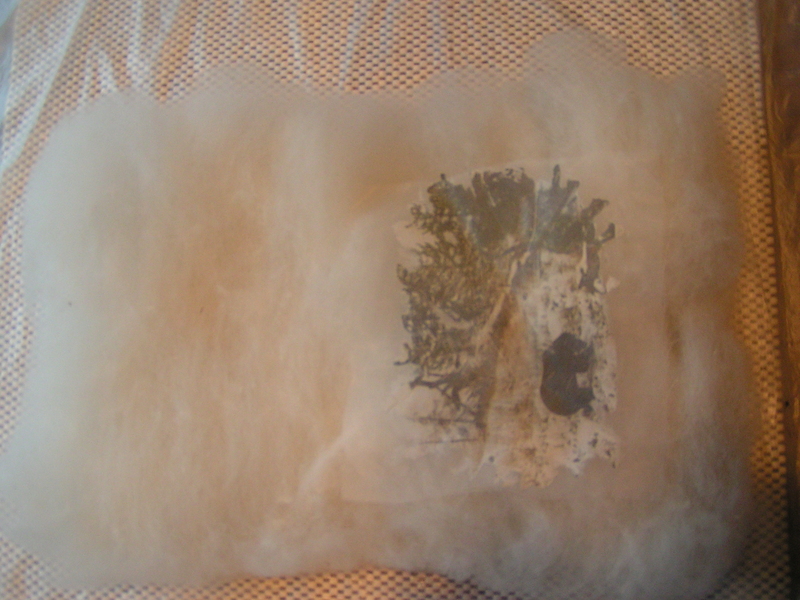 Take a look at Teri Berry’s post and Kim Winter’s post where they tried out my idea for combining fabric paper lamination with nuno felting. 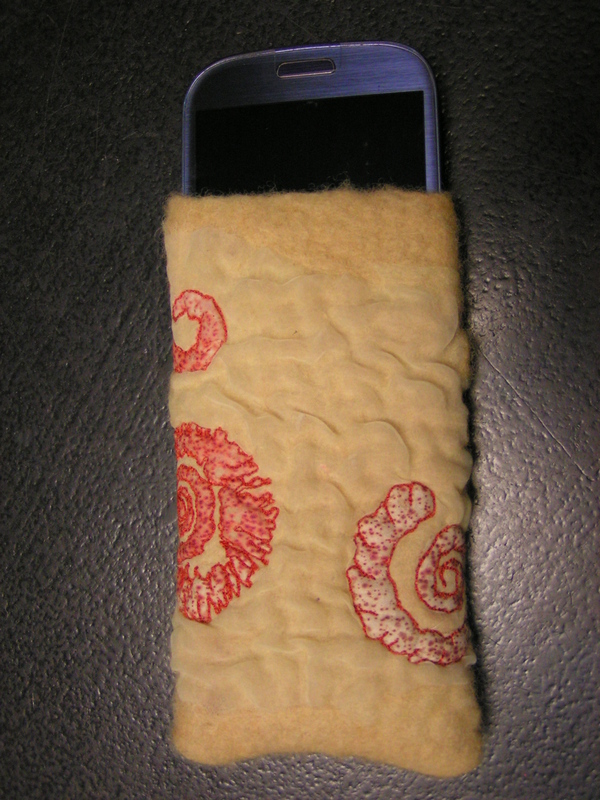 This entry was posted in Nuno Felting and tagged fabric paper lamination + nuno felting, felted phone case, free motion machine stitching. Bookmark the permalink. The fossils are very pretty! I like them equally with and without stitching. 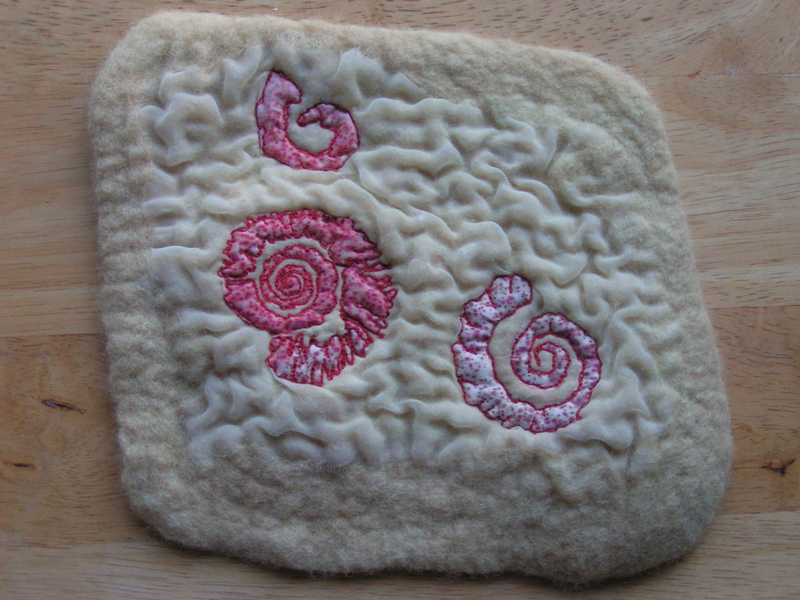 It’s a fascinating technique to use in felting. What do you think the bear would look like with a bit of stitching? Thanks Lyn – I am planning on adding stitching to both of the others. I just haven’t had time yet. I was really excited that it worked so well. I see more possibilities in this technique. Wow, I’m in love with your fossils, the stitching really brings them to life. I have been completely absorbed by this technique, this morning I was nuno felting some samples with materials other than paper, some have worked beautifully others were total failures. Will share more in a post tomorrow. Thanks Teri. I can’t wait to see what else you come up with in your experiments. It has lots of potential, doesn’t it? They all look great. 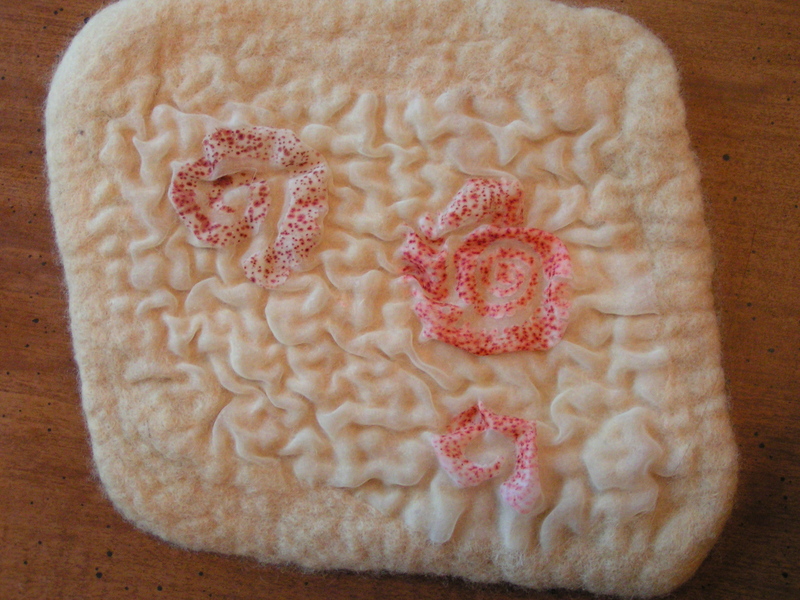 It appears the more open designs do better with the felting so there is more area to catch fiber. Thanks for sharing! Thanks Marilyn, the more open, simple designs do work the best. The fossil piece looks gorgeous – the stitching really lifts it! Look forward to seeing the other pieces after you’ve stitched them! Thanks Kim – hopefully I’ll get the others stitched soon. 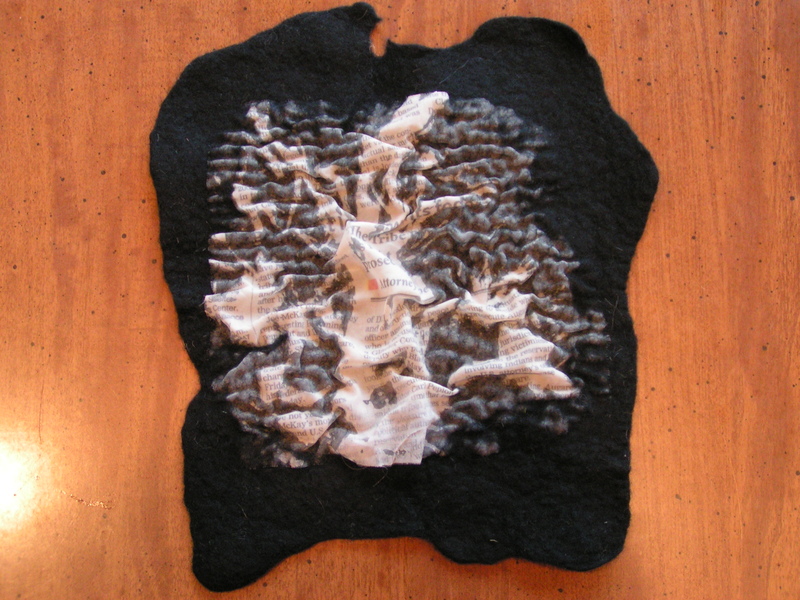 Very unique effect you get with the paper and wool. Not like anything else I’ve seen. 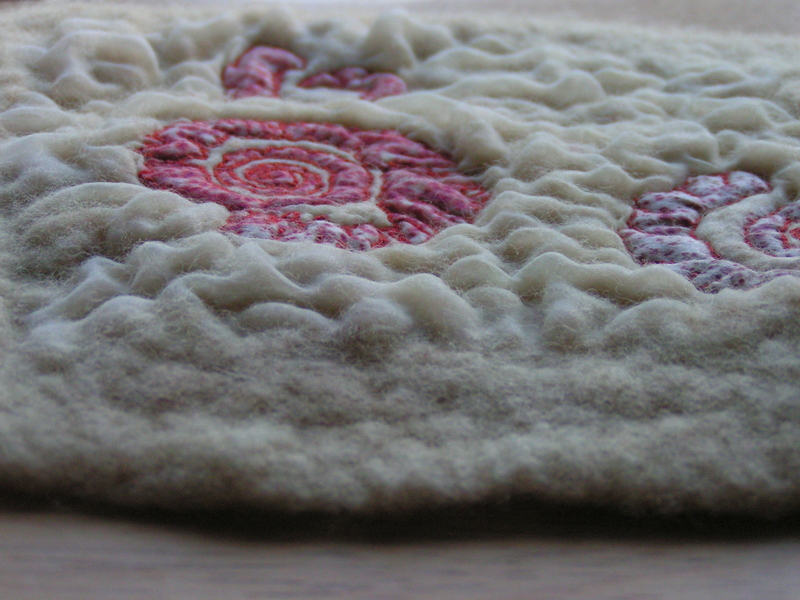 Thanks Judy – it is the best method I have found yet for transferring a more intricate design on to felt. The fossils with the stitching are really striking. I can’t believe how you went around all those intricate squiggles. I think the others will improve with stitching too. It is an interesting idea. maybe I will find some time to give it a try this winter. Thanks Zed – I think the newspaper one is the most interesting.